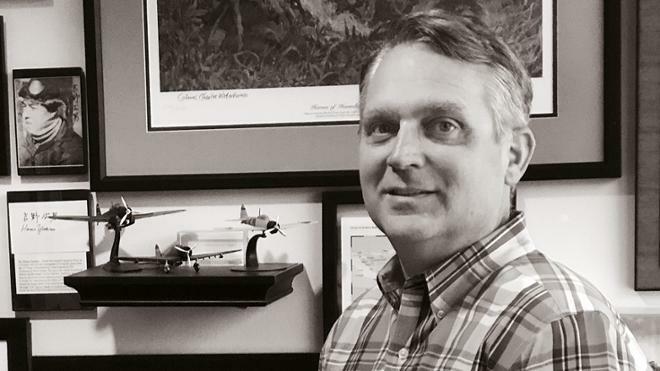 In his office, Greg McCracken, L’89, is surrounded by artifacts from our nation’s wars. Photos, prints, and books — many of them autographed — flags, medals, and shells are all over. “I have sand from Iwo Jima given to me by one of the men who went ashore there,” he said. His collection also includes a German coal scuttle helmet, a spike bayonet from Vietnam, and model ships and airplanes he has been building for years. Of greater value, McCracken says, are the stories told by the veterans who provided many of these artifacts and the friendships he has developed with them. McCracken hesitates to call all this a collection. “It’s not like baseball cards or something,” he said. Instead, the material he has pulled together “inadvertently” is “a tribute, a memorial, a thank you” to veterans who fought for their country in wars from World War II to the present. Since his boyhood in Bristol, Virginia, McCracken has been interested in military history and machinery, and he has read voraciously on those subjects. He convinced his parents to let him enlist in the Army Reserve in high school. He joined ROTC at East Tennessee State University. After graduating from law school, McCracken went to Virginia Beach, Virginia, where he worked for law firms in general practice. In 1997, he took a job with the Navy, managing its federal tort claims division. It was an office job that included running investigations and providing litigation support for the U.S. Attorney. In 2006, he joined his wife Michelle Phillips McCracken, also L’89, at Fine, Fine, Legum and McCracken. Living and working in Tidewater, Virginia, he is regularly in contact with active and former military people, which helps fuel his interest. Much attention has been given to the passing of “the Greatest Generation” of veterans from World War II, and that era comprises the bulk of McCracken’s collection. But he points out that veterans from Korea and Vietnam are dying now in increasing numbers. McCracken intends to catalog his collection “to find out what all I have.” Then he’ll seek an appropriate place — probably a university or museum — where it can be kept as a memorial.